A man has appeared in court charged with making explosive devices at his Peterborough home. James Reginald Need (37) of New Road, Woodston, Peterborough appeared in the dock at Peterborough Magistrates' Court today (Monday) charged with making an explosive substance with intent to endanger life/injure property. 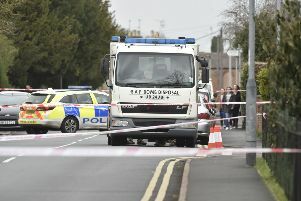 Need was charged in connection with the incident on Saturday, March 16, when emergency services - including the bomb squad - were called to New Road following reports an explosive device had been found. Need, who wore a grey tracksuit, spoke to confirm his name, address, date of birth and English nationality. Michelle Canagasuriam, defending, made no representations to the court. Magistrate Allison Marsh said the case would be heard on Monday, March 25 at Peterborough Magistrates' Court - unless the prosecution applied to have the case heard sooner. Need was remanded into custody, and will appear at the next hearing by video link. Residents were ordered to evacuate the area after emergency services were called on Saturday afternoon. Many took refuge in Belsize Community Centre while officers worked at the scene. The cordon was lifted around midnight. These are the 24 areas with the highest reports of crime in Peterborough - how does your area compare?